Chinese Red Jujube also known as chinese red dates. Chinese Red Jujubes is extremely high in vitamin C. In addition to their medicinal use, the candied dried fruits are often eaten as a snack, or with tea. Chinese Red Jujube can be used for cooking as well as part of the ingredient of Eight Tresures Tea. 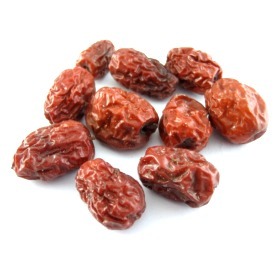 Red to purplish-black wrinkles dried fruit, looking like a big raisin.